A 7cm X 30cm, double-sided, six page colour concertina zine with B&W text on a pale green paper wrap held in place by a dark green circle sticker. 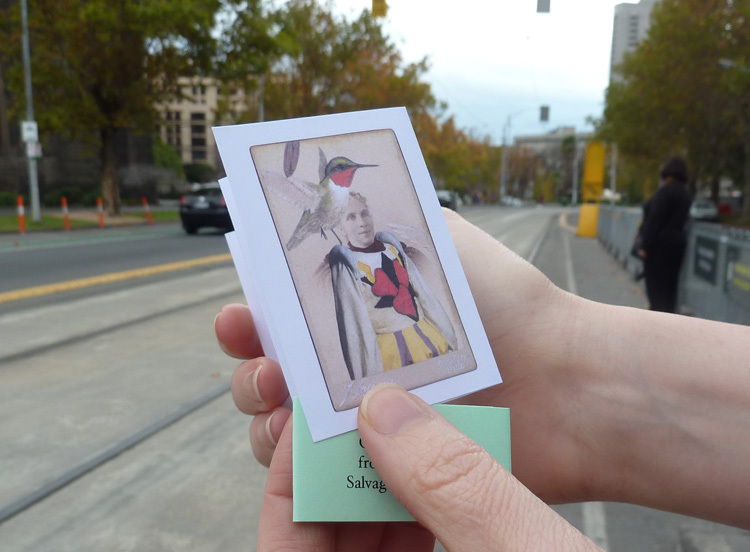 In a borrowed costume from Pulcinella, deigned by Giorgio de Chirico, 1932, with a male ruby-throated hummingbird (Archilochus colubris). In the borrowed costume for a court lady from the ballet in three acts and five scenes, The sleeping princess, designed by Léon Bakst, c 1921, with a Strawberry finch (Amandava amandava). Beneath the wings, in the modified costume for a musician from the ballet in one act, Armida’s pavilion, designed by Alexandre Benois, c 1909, with a Frilled coquette (Lophornis magnificus) and a Bee hummingbird (Mellisuga helenae). In the modified costumed for a Syrian woman from Cleopatra, designed by Léon Bakst, 1909 and 1930s, a Marvellous spatuletail (Loddigesia mirabilis). In the modified costume for the Countess from the ballet in one act, The temptations of the shepherdess (or L’Amour vainqueur), designed by Juan Gris, c 1924, with a Kestrel (Falco tinnunculus). In the modified costume for the Bluebird from the ballet in three acts and five scenes, The seeping princess, designed by Léon Bakst, c 1921. 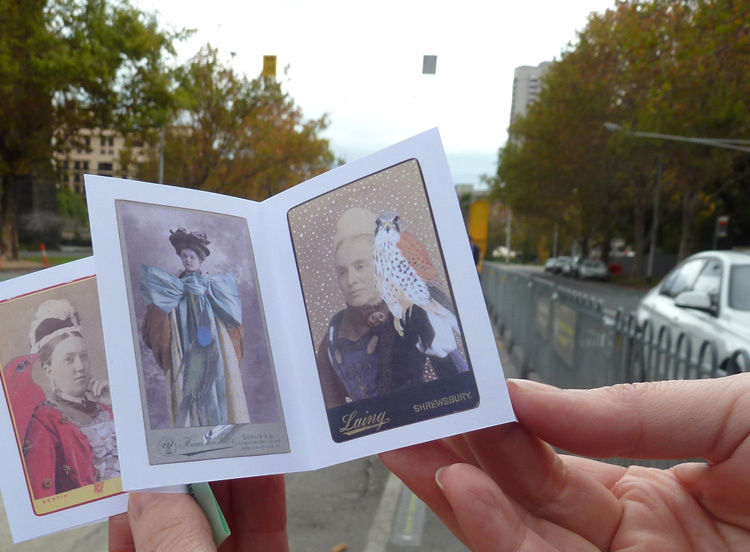 One of several zines made for the National Gallery of Victoria's inaugural Melbourne Art Book Fair in the Great Hall, NGV International, May 2015. 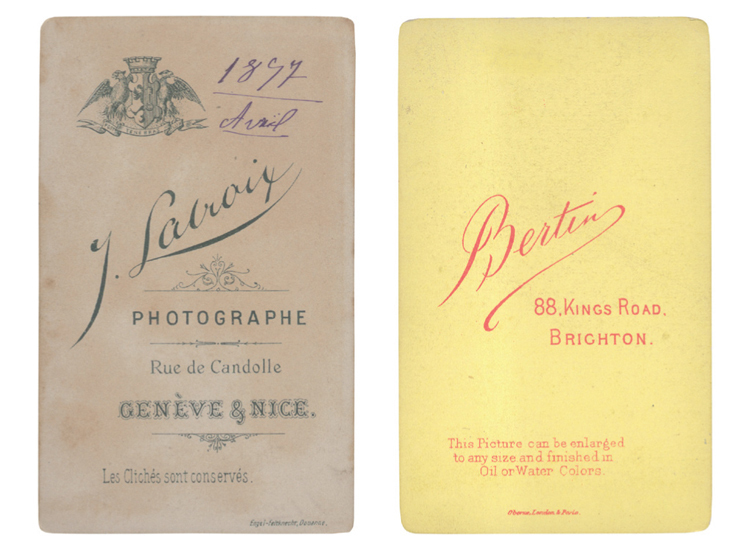 The companion to this zine is Gentlemen from a deck of Salvaged Relatives. 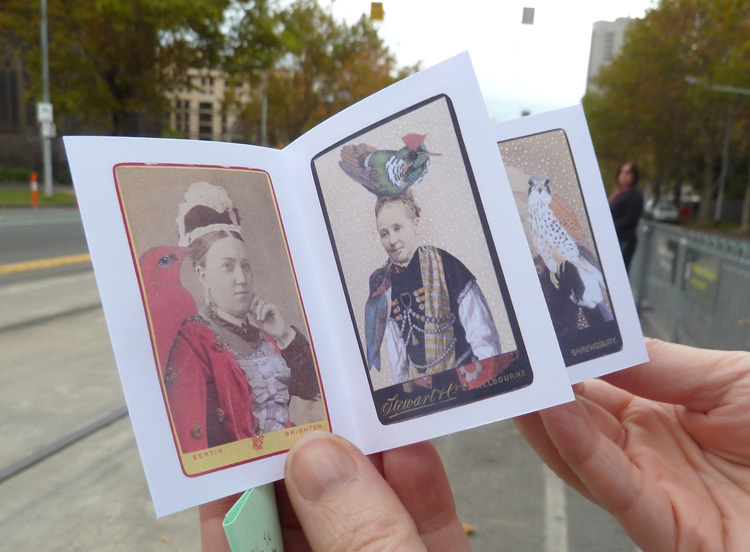 This zine featured in the touring exhibition, Self-made: Zines and Artist Books, at the State Library Victoria, 2017, alongside the artists' book, A Deck of Salvaged Relatives, from which the collages were drawn. 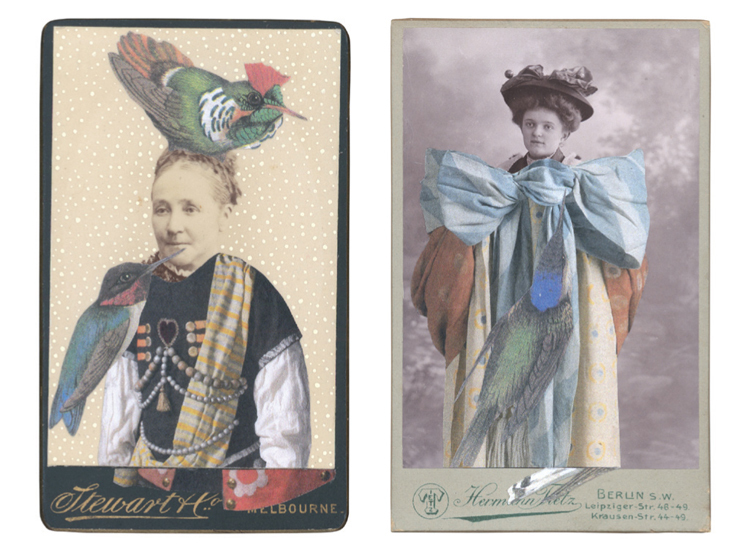 Salvaged Relatives: New work by Gracia + Louise, Alice Cannon, Book Arts Newsletter, UK, 2015, published by Impact Press at the Centre for Fine Print Research, UWE Bristol, UK, and edited by Sarah Bodman.